Hear the author read a brief selection from the novel. Learn more about the annual Baghdad Bazaar. 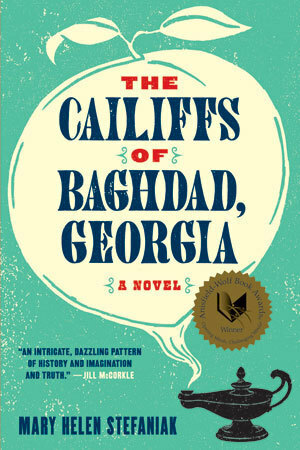 The fate of a camel driver on the Arabian Peninsula in 1916, the birth of a circus in the wake of Sherman’s army, the role of an enchanted pitcher in a ninth-century war, and the journey of an ingenious young Muslim from his African home to the coastal islands of Georgia—all these and other surprising stories come to light as The Cailiffs of Baghdad, Georgia rides a magic carpet from a schoolroom in the South to the banks of the Tigris (and back again) in an entrancing feat of storytelling. Narrator Gladys Cailiff is eleven years old in 1938 when a new schoolteacher turns Threestep, Georgia, upside down. Miss Grace Spivey is a well-traveled young woman who believes in field trips, Arabian costumes, and reading aloud from her ten-volume set of One Thousand Nights and a Night. The real trouble begins when she decides to revive the annual town festival as an exotic Baghdad Bazaar. Miss Spivey and her project transform the lives of everyone around her: Gladys’s older brother Force (with his movie-star looks), their pregnant sister May (a gifted storyteller herself), and especially the Cailiffs’ African American neighbor, young Theo Boykin, whose creative genius becomes the key to a colorful, hidden history of the South. "Mary Helen Stefaniak is a born storyteller, with a fantastic gift for mingling the exotic and the ordinary, the comic and the heartrending. Her tale of drastic change coming to a small Southern town in the 1930's is filled with wild incidents, vivid characters, and a surprise at every turn--a delight to read." Miss Grace Spivey arrived in Threestep, Georgia, in August of 1938. She stepped off the train wearing a pair of thick-soled boots suitable for hiking, a navy blue dress, and a little white tam that rode the waves of her red hair at a gravity-defying angle. August was a hellish month to step off the train in Georgia, although it was nothing, she said, compared to the 119 degrees that greeted her when she got off the boat one time in the place she called Al-Basrah. I believe her remark irritated some of the people gathered to welcome her on the burnt grass alongside the tracks. When folks are sweating through their shorts, they don't like to hear that this is nothing compared to someplace else. Irritated or not, the majority of those present were inclined to see the arrival of the new schoolteacher in a positive light. Hard times were still upon us in 1938, but, like my momma said, “We weren’t no poorer than we’d ever been,” and the citizens of Threestep were in the mood for a little excitement. Miss Spivey looked like just the right person to give it to them. She was, by almost anyone's standards, a woman of the world. She’d gone to boarding schools since she was six years old, she’d studied French in Paris and drama in London, and during what she called a “fruitful intermission” in her formal education, she had traveled extensively in the Near East and Africa with a friend of her grandmother’s, one Janet Miller, who was a medical doctor from Nashville, Tennessee. After her travels with Dr. Miller, Miss Spivey continued her education by attending Barnard College in New York City. She told us that at school the first day. When my little brother Ralphord asked what did she study at Barnyard College, Miss Spivey explained that Barnard, which she wrote on the blackboard, was the sister school of Columbia University, of which, she expected, we all had heard. It was there, she told us, in the midst of trying to find her true mission in life, that she wandered one afternoon into a lecture by the famous John Dewey, who was talking about his famous book, Democracy and Education. Professor Dewey was in his seventies by then, Miss Spivey said, but he still liked to chat with students after a lecture—especially female students, she added—sometimes over coffee, and see in their eyes the fire his words could kindle. It was after this lecture and subsequent coffee that Miss Spivey had marched to the Teacher’s College and signed up, all aflame. Two years later, she told a cheery blue-suited woman from the WPA that she wanted to bring democracy and education to the poorest, darkest, most remote and forgotten corner of America. They sent her to Threestep, Georgia. Miss Spivey paused there for questions, avoiding my brother Ralphord’s eye. What we really wanted to know about—all 26 of us across seven grade levels in the one room—was the pearly white button hanging on a string in front of the blackboard behind the teacher’s desk up front. That button on a string was something new. When Mavis Davis (our only bona fide seventh grader at age thirteen) asked what it was for, Miss Spivey gave the string a tug, and to our astonishment, the whole world--or at least a wrinkled map of it--unfolded before our eyes. Miss Spivey’s predecessor, Miss Chandler, had never once made use of that map, which was older than our fathers, and until that moment, not a one of us knew it was there. Miss Spivey showed us on the map how she and Dr. Janet Miller had sailed across the Atlantic Ocean and past the Rock of Gibraltar into the Mediterranean Sea. Using the end of a ruler, she gently tapped such places as Morocco and Tunis and Algiers to mark their route along the top of Africa. In Egypt, she said, they stopped long enough to climb a pyramid, a sketch of which she drew for us on the board, next to the map. "I wish I could convey to you children its true size and grandeur," she said. From there, they went on through the Gulf of Suez and down around Arabia and right up the Persian Gulf, which Miss Spivey said was the most beautiful body of water in the world. They spent twenty hours on the train to Baghdad after that, swathed in veils against the sand that crept in every crack and crevice. I pictured them with scarves pulled across their faces, like a pair of lady bandits. “And can you guess what we saw from the train?” Miss Spivey asked. We could not. “Camels!” she said. “We saw a whole caravan of camels.” She looked around the room, waiting for us to be amazed and delighted at the thought. We all hung there for a minute, thinking hard--you could see the anticipation on Miss Spivey’s face fading as the seconds passed--until Mavis Davis spoke up. “She means like the three kings rode to Bethlehem,” Mavis said, and she folded her hands smugly on her 7th-grade desk in the back of the room. Miss Spivey made a mistake right then. Instead of beaming upon Mavis the kind of congratulatory smile that old Miss Chandler would have bestowed on her for having enlightened the rest of us, Miss Spivey simply said, “That’s right.” I think maybe she was so flabbergasted that we didn’t all of us know what a camel was that she wasn’t sure what to do next, and what she did do only made Mavis feel all the more under-appreciated. Miss Spivey turned from the map--actually, she whirled around with all the flowery layers of a dress the Superintendent of Schools would later call “inappropriate” fluttering around her legs--and she pointed with her piece of chalk straight at me. My heart was making such a ruckus in my ears as I stood up that I hardly heard her ask my name. I thought she already knew it, based on the name cards she’d stuck on our desks. "Ma'am, it's Gladys," I said. "Your last name, please, Gladys." "Can you spell that for us, please?" Of course I could spell my own name. I was the Number One pupil in the fifth grade row that particular year. Miss Spivey wrote my name on the board, letter by letter, as I called them out. The chalk squeaked a good one when she crossed the double FF, and when she revealed that the ruler of far-off Baghdad was also a Cailiff, nobody was more surprised than I was. Mavis snorted loud enough for half the room to hear, but Miss Spivey only smiled. Then she wrote Caliph on the board, and the way she lined up the letters under my last name, everybody in the room could see what she was getting at, even my brother Ralphord and the ones who couldn’t read. Only Mavis looked annoyed. “Them’s two different words,” she said.